Summary: Abraham OBEYED a GOD he had never seen. Abraham PATIENTLY WAITED for a CITY he had never seen. He walked by FAITH, not by SIGHT. Scripture calls Abraham “the father of all them that believe” (Romans 4:12). The subject of today’s lesson is: THE LIFE OF FAITH IS THE ONLY LIFE THAT PLEASES GOD. It is the confident assurance that what we hope for is going to happen. And it is the evidence of things we cannot see, according to Hebrews 11:1. Abraham OBEYED a GOD he had never seen. Abraham PATIENTLY WAITED for a CITY he had never seen. He walked by FAITH, not by SIGHT. Scripture calls Abraham “the father of all them that believe” (Romans 4:12). As Abraham’s spiritual descendants, we are expected to walk as he did: “We walk by faith, not by sight” (2 Corinthians 5:7). I have never witnessed the glory of God as Moses did. I have never seen the nail wounds in Jesus’ hands like Thomas did. I have never seen the Spirit descending like a dove as the disciples did. I have never received a vision of heaven like John did. And yet, I live by believing all of these things, by faith. I have banked my earthly life and my earthly destiny on these things which I have never seen. However, there’s nothing unusual about my faith, since THE PEOPLE OF GOD HAVE ALWAYS LIVED BY FAITH. There are two things I want to say about Abraham’s faith, that’s found in Hebrews 11. I. BY FAITH ABRAHAM OBEYED THE CALL OF GOD (v. 8). II. BY FAITH ABRAHAM WAITED PATIENTLY FOR THE PROMISE OF GOD (vv. 9-10). God told Abraham to leave everything and Abraham obeyed. He obeyed an invisible God’s command to go to an unknown place. FAITH AND OBEDIENCE CAN NEVER BE SEVERED. OBEDIENCE IS FAITH’S DAUGHTER. That is to say, obedience grows out of faith. • Matthew—“. . . [Jesus] went forth and saw a publican, named Levi, sitting at the receipt of custom: and he said unto him, Follow me. And he left all, rose up, and followed him” (Luke 5:27-28). • Zacchaeus—“And when Jesus came to the place, he looked up, and saw him, and said unto him, Zacchaeus, make haste, and come down; for to day I must abide at thy house. And he made haste, and came down, and received him joyfully” (Luke 19:5-6). • Saul of Tarsus—“And he trembling and astonished said, Lord, what wilt thou have me to do? And the Lord said unto him, Arise, and go into the city, and it shall be told thee what thou must do. . . . And Saul arose from the earth; and when his eyes were opened, he saw no man: but they led him by the hand, and brought him into Damascus” (Acts 9:6, 8). Abraham, Matthew, Zacchaeus, and Saul all had one thing in common: they left their old way of life to embrace a new one with God. 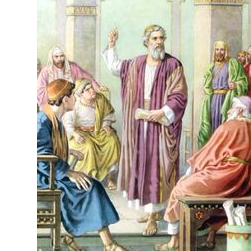 Joshua proclaimed to the children of Israel that before God called Abraham, he “served other gods” (Joshua 24:2). Vance Havner once said, “You have not really learned a commandment until you have obeyed it. . . . The church suffers today from Christians who know volumes more than they practice”. Rebellion is wanting to do what I want to do. This really is the real meaning of sin. Sin is doing what I want to do even though it offends God, even though it may hurt others, and even though it may hurt myself in the end. We were all born into this world as rebels. No one has to teach a child how to be selfish. Abraham OBEYED a GOD he had never seen. Abraham PATIENTLY WAITED for a CITY he had never seen. He walked by FAITH, not by SIGHT. Scripture calls Abraham &#8220;the father of all them that believe&#8221; (Romans 4:12).